Today, we have officially reached over 1000 RSS subscribers, more exactly 1,038 people that are registered for our RSS feed or by email updates. That is impressive number and it shows how loyal the BMW fans really are. Since our recent name change that took place back in February, the internet traffic has tripled and it reaches over 10,000 visitors/day. With almost 1600 articles posted since the initial launch at the end of 2006, we have become the most important BMW related blog and a must-read website for all the true bimmer fans and not only. Our team has expanded from one blogger and an editor, to multiple editors and new writers, that brought a diversity of articles on the blog. With this occasion, I would like to thank the following people: Brock, Josh, Irv, Fazal, Stefan, Benny, Jake, Davina, Andrew, Malcolm, Mark, Giom, Tim and Mitch. And last but not least, a big shoutout and many thanks to our "friends close to BMW" that have shared with us many valuable information over the time(you know who you guys are). 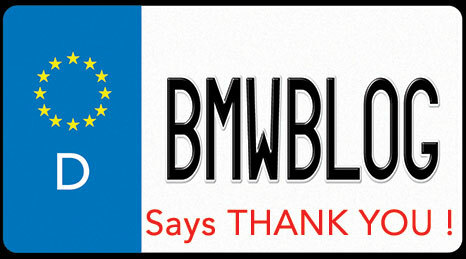 Once again, thank you all, you have really made BMWBlog a better and more interesting place. And in the end, a big THANK YOU to our lovely readers, we could not have done it without you and your support. For those of you that are regular readers or just one time visitors, I strongly encourage you to sign up for the RSS feed, either by email or simply through an RSS reader like Google Reader, FeedReader, Netvibes, Newsgator, Yahoo and many others. You will have access to the latest BMW information, photos, videos, rumors, pricing and other car related articles.